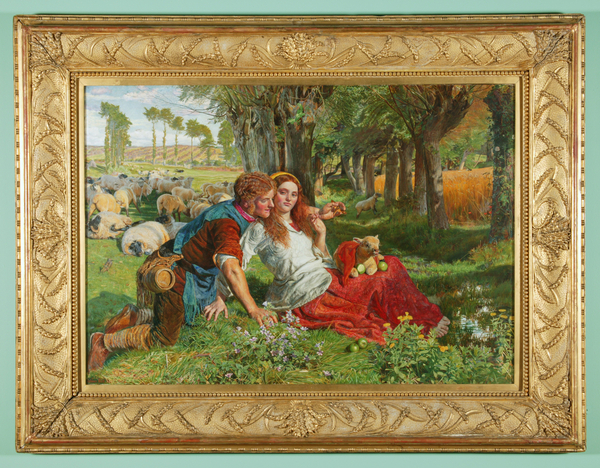 A vividly coloured, minutely detailed painting of a shepherd and shepherdess, seated on the ground in a lush green summer meadow, surrounded by their sheep, a willow-lined grassy stream behind them. The shepherd is a 'hireling', a biblical reference [John 10,12]. In the centre, the young shepherdess leans back on her right arm, flirting with the young shepherd who is leaning forward on his knees with one arm around her shoulder showing her a death's head moth in his hand. The shepherdess is wearing a white long sleeved smock, with white circular embroidery, over a bright red dress, a yellow head scarf over her auburn hair. The shepherd wears a bright blue over-garment, secured at his waist with a belt, from which hangs a small barrel. His lower legs are bound with rope. Behind him on the left, his flock of sheep stray untended towards the trees and cornfield on the right, some of the sheep already amongst the corn. In the left foreground, two bloated sheep lie on the ground poisoned by the corn. 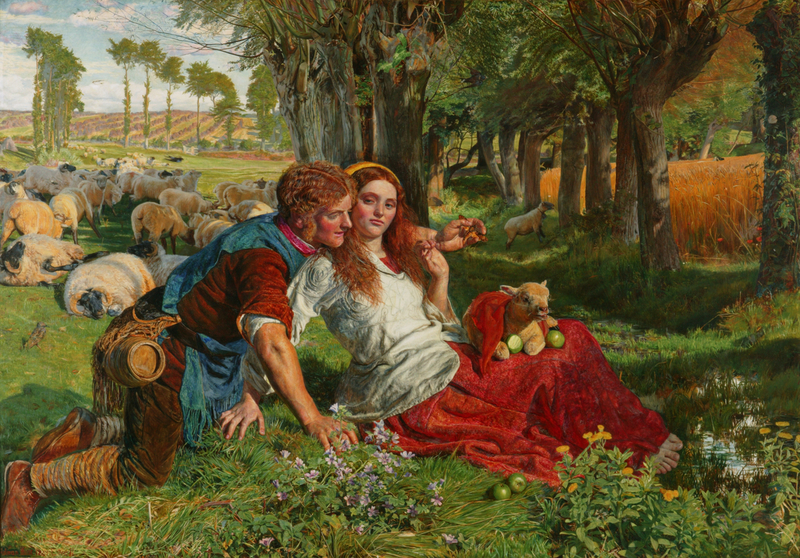 The shepherdess has a small lamb on her lap, partly covered with a red shawl, eating sour apples, two of which have fallen to the ground beside her. Her bare feet are close to a small stream in the right corner. Yellow and purple flowers grow in the foreground, with poppies on the border of the cornfield. A line of tall trees is visible in the background to the left, with a field containing rows of hay behind. The frame is decorated with raised mouldings of wheat ears, with sheaves of wheat in the corners and centre of the sides, and beading along the inner edge.